Whether you’re just looking for a massage or you believe that pressure points in the body link to different parts of your health, an acupressure mat is a great item to have at home. It’s the perfect thing to add to your meditation space or keep on hand for any time when you might want to relax. Designed with tiny spikes that are intended to stimulate pressure points in your back and neck, acupressure mats help to release endorphins and can help to promote better wellness and health. Some people find that using one can improve their sleep or help them manage pain, as well as help them meditate. When you’re looking for an acupressure mat, you should consider the quality, comfort and the cost. You might also want to think about how easily it can be cleaned, especially if an acupressure mat is something you’re thinking of using during or after a workout. Size is also important, and you should also check whether or not the mat comes with a pillow so that you have support for your head and neck if you need it. Some mats will also provide statistics from studies that show how effective they might be at providing certain benefits. If you’re looking for the perfect acupressure mat, here are some top suggestions to help you choose the best one. This pressure point mat from Nayoya comes with a pillow that’s perfect for placing under your neck so you can lie comfortably. The mat has more than 6,200 tiny pressure points to help stimulate blood flow, among other benefits, while the pillow has over 1,700. The mat and pillow are separate items, so you can use them however you like, whether you use them separately or together. You can attach the pillow to the top of the mat if you want to use both items at the same time. The mat measures 16″ x 26″ and the pillow is the same width as the mat. It’s large enough for your head, shoulders and torso. You can wash the mat by hand with a damp cloth or sponge after removing the foam insert. The material is cotton, with plastic acupressure spikes, making it simple to care for. It comes with a carry bag that features handles for easy carrying, so you can take it to the gym or even the office, as well as neatly put it away when you’re not using it. You can use it lying on the floor, but many people choose to have the mat under them when they’re sleeping too. The harder the surface under the mat, the more pressure you will get it from. While the mat isn’t large enough for your whole body at once, you can use it on different parts of your body with ease. 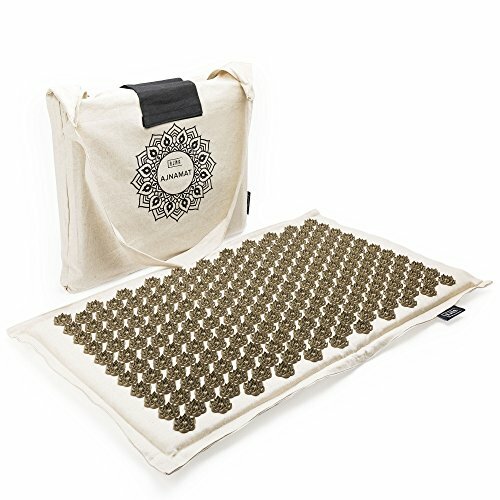 The Ajna Eco Acupressure Massage Mat features lotus-shaped pressure points with over 5,000 precision-engineered spikes. This organic mat is made with sustainable coconut fiber filling, as well as organic cotton and linen blend fabric and medical grade HIPS plastic. It’s non-toxic and ethically made and has been designed in Australia to deliver an excellent experience. A tree is even planted for every mat that is sold. This mat comes with a handy carry tote bag with handles, so you can pack it up to take to the gym, your yoga class or your next relaxing trip away from home. This mat doesn’t come with a pillow, although a matching pillow is available to purchase if you want one. As with some other mats, you can care for this one by removing the filling and hand washing the exterior cover. You can choose from pink, black or natural colors to get the look that you want. This sturdy mat holds its shape and is easy to move around so you can use it anywhere and for a range of purposes. It’s a durable option made from natural materials that should last for a long time. The lotus-shaped clusters of spikes on this mat are designed to give you an even massage. If you’re looking for an eco-friendly option, you’ll also be happy to know that this mat avoids excessive packaging, sticking with the free carry bag instead. The Spoonk mat is made from thick cotton and plant-based eco foam. With navy and pagoda blue options, it’s a stylish option. Spoonk is the brand that you’re likely to find offline if you’re looking for an acupressure mat, and is sold in health stores. It’s made in the USA and has 6,200 stimulation points, which they say is the optimal number to have. You get a five-year warranty on this mat so you can feel confident that it’s going to last a long time. There’s also a 30-day money back guarantee from the manufacturer, allowing you to return it if it’s not right for you. The stimulation points are made from non-toxic ABS plastic to offer a safe material, especially for more sensitive skin. The mat comes with a carry bag with a strap so you can take it to the gym or elsewhere, or just store it somewhere compact. The mat measures 15″ x 36″ and it easily rolls up into the travel bag when you want to put it away. As a leading brand, it’s a popular choice but it won’t let you down if you have high expectations. It’s a quality choice with a good warranty so you know you can rely on it. Spoonk also has a pillow available if you want to buy one to go with the mat. This mat is recommended by some big names and easily available. It’s a tried and trusted option if you want an acupressure mat. The HemingWeigh acupressure mat and pillow come with a bonus carry bag to package them into. There are 8,820 contact points on these mats, which measure 29″ x 17″, offering more surface area than many other mats. If you’re looking for something larger, this mat could be the right one for you. The pillow measures approximately 16″ x 6″ x 4″, offering more support for your head and neck and pairing perfectly with the mat. Although it’s larger, it’s still easy to carry around thanks to the carry bag that comes with it. You can roll the mat and put the pillow in the center to carry both items at once. You can choose this mat in black, green or purple. The HemingWeigh mat is one of the most reviewed acupressure mats out there, partly because it’s also one of the most affordable options. It’s good quality too, so saving some money doesn’t mean that you have to compromise too much on the experience that you receive. The quality is equal to and even better than some more expensive products, so it offers a great choice for anyone who’s on a budget. The design is very similar to some other models too, giving you a mat that’s largely the same. The color options mean you have several choices and the addition of the pillow makes it an even better deal. Swedish acupressure mat, Can help with back pain, tension, stiffness, stress, insomnia, fatigue and many other conditions. It helps to promote the release of the body's own pain-relieving and happiness hormones - endorphins and oxytocin- which help to release tension, create relaxation and promote a sense well-being. The Mat and Pillow gently touches your body's acupressure points and endorphins are released whereupon you experience a gently warming, soothing sensation in your body and mind. 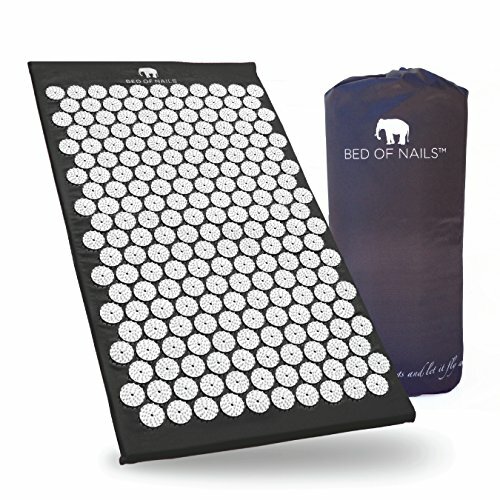 Bed of Nails is another top brand for acupressure mats, and it offers 8,820 individual spikes to give you the stimulation that you’re looking for. The durable construction features non-toxic plastic spikes, as well as cotton fabric. It’s a pricier option than some other choices, but you might feel that it’s worth it for a well-known brand that you can rely on. It comes with a carry bag for transportation, and it’s available in black, green or pink. This mat measures 16.5″ x 28.5″, offering plenty of space. A Bed of Nails acupressure pillow is available if you want to purchase a matching item to go with it. The Bed of Nails mat has a lot more pressure spikes than many other mats, which is a definite benefit for anyone that wants as many as possible. It might not be the right choice for everyone, especially if you’ve never used an acupressure mat before. But if you have previous experience using an acupressure mat or you’re ready to dive in and start using one, this large option with plenty of spikes is a good choice. 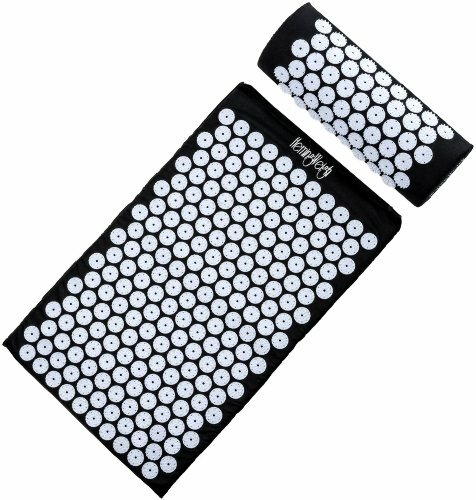 AFFORDABLE ACUPRESSURE MAT: Effective and affordable treatment for back pain, neck pain, arthritis aches and pains, insomnia and more! ERGONOMIC DESIGN: BON's modern design allows the mat to trigger the body's self-healing mechanisms for radiant health. CONVENIENT PACKAGING: Allowing you to experience the health and meditation benefits of acupressure anywhere. PROVIDES LASTING EFFECTS: BON's mat lowers the "stress hormone" cortisol while releasing endorphins (or "feel good hormones"), creating an overall more positive and relaxed state of mind that lasts throughout your day. EASY TO CLEAN AND MAINTAIN: BON's sleek and effortless design makes cleaning easy! Simply brush with detergent, rinse and hang dry. An acupressure mat is a good item to add to your home comforts and wellness items. If you’re looking for something that can help you relax while also stimulating your circulation and pressure points in your body, one of the recommended acupressure mats above can deliver. Using an acupressure mat for just a few minutes a day can have a range of health benefits for you, and you could need as little as ten minutes a day. Some people say that acupressure mats help them to relax, while others say that it gives them energy when they use one.